Will You Dare to Love? It’s all over the news. The world can’t stop watching. We shouldn’t stop watching. We know that all around the world there are people being persecuted. It may be for their social position, for their unique abilities, for their family status or it may be for their faith. In Iraq there are many people who fall into that last category. You’ve seen it on the news if you are even remotely plugged in to what’s going on in the world. The President has spoken on it several times lately. In Iraq, Christians are being given an ultimatum. “Convert, pay up… or DIE.” Yep, those are the options. Give up your faith, pay them money, or ‘face the sword’. Wow, sounds like an offer they can’t refuse. In a country where the national average is $5000, a lot of people don’t have the money to spare in order to pay ‘protection money’. 25% of the people in Iraq live below the poverty line. So they run. Leaving all they have known, towards the unknown with just the clothes on their backs. It’s all over the news. How can we see this and do nothing? 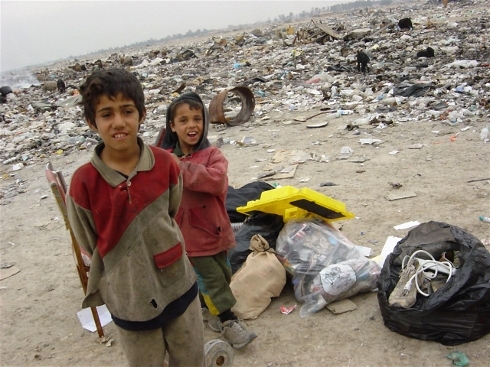 Forced to dig through garbage to help make a living for their families. Photo from UN. A sweet friend of mine, along with a few of her friends, have set up an organization called ‘DARE TO LOVE’. They aren’t a national organization, but they have their hearts set on the nation of Iraq. They are selling t-shirts and giving 75% of the proceeds to ‘Samaritan’s Purse’. I asked her a few questions and would like to share them with you. Alex has been on my blog before. If you’ve been following for a while, you’ll remember her as we followed her journey with her sweet daughter Noel. Now, Alex has taken up the cause of many other families. Thanks, Alex for chatting with me. Tell us, what is it about this cause that drew your attention? As you know Caleb and I lost Noel 16 months ago. I’m a completely different person from 16 months ago. I may not physically look different but if you were to look at my heart, it would be crushed into a billion different pieces. Not only because I lost my daughter but because God reveals to me everyday that I’m not the only one with a heart in this condition. Reading and learing and seeing what is happening in Iraq would leave me speechless. I asked God to impress on my heart what the Iraqi people were feeling. An overwhelming amount of sadness and heartache and hopelessness came over me. I knew, this is how they feel times 100. I would wake up in the middle of the night and cry and pray. I can only imagine how it would feel to lose a loved one the way they have. To lose a child the way they have. So I guess to answer the question, my heart breaks every day for them. How did the ‘Dare to Love’ idea begin? I recently ordered a shirt from two girls to benefit The A21 Campaign, a campaign that saves and helps human trafficking victims. I wanted to do something similar, ok well the exact same, ha ha ha! I know it may seem silly but I really admired what they did and thought doing something like this was out of reach. I read something Christine Caine said, “If you can figure a way to make it happen, you need to DREAM BIGGER.” Well, I figured a way to make this happen, so I just need to dream bigger. How did you determine the right charity to donate the money to? I’m not sure if you know this but a Franklin Graham Festival came through El Paso, TX this year in April. I was blessed enough to work for them. Franklin Graham started Samaritan’s Purse. Samaritan’s Purse has been helping people who are suffering in Iraq. Since I worked for the Billy Graham Evangelistic Association choosing Samaritan’s Purse was a no brainer. And of course I prayed about it! I think a shirt is a great way to promote anything. Not only are you donating to a worthy cause but you become a walking billboard. If someone asks, “What’s Dare to Love?” you can tell them what it is and why you decided to give to this specific charity and cause. I think we would be shocked by how many people are blinded by what’s happening in the world, so the shirt is a great conversation starter. CHECK OUT THE WEBSITE HERE! Help Iraqi families and get your shirt to start the conversation! I’d love to add first names here of people who donated! Will you be the first? Let me know if you donate and I’ll add your name here!! For many months now I have been following a story that didn’t take long to work into my daily thoughts. I find myself praying often, day and night, for a man and a family I have never met. If you haven’t heard of Pastor Saeed Abedini, let me tell you a bit about his story and why he is heavy on my heart these days. In July 2012, Pastor Saeed was detained in Iran and told he must stand trial for his Christian faith. The trial never happened. Instead Pastor Saeed was taken out from under house arrest and transported to Evin Prison in Iran. No trial. In Evin Prison he was subject to solitary confinement for many weeks and torture. Though he was tortured, he was denied medical treatment for his injuries because he is Christian. President Obama, Billy Graham and countless others have petitioned the Iranian President to release Pastor Saeed. 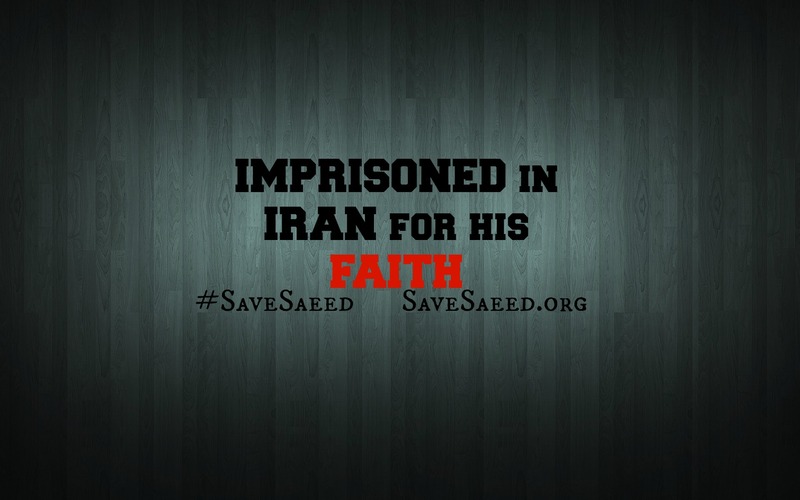 Instead of forward progress, Pastor Saeed was moved from Evin Prison to Rajai Shahr Prison. Not only is he in this terrible prison, but he is being housed in the ‘violent criminal’ ward. Where a 3 meter by 3 meter cell is shared by murderers and rapists. In this prison, in this ward, prisoner on prisoner violence (including murder) is common place. We’ve just been informed today that he has been robbed numerous times, denied his medication and left in deplorable conditions so that lice has taken over his body and his health is quickly deteriorating. Iran has send him to disappear and he has been left for dead. This is where he spends his days and his nights. I can’t imagine how hard it must be. Away from everything he’s known and his family. For 435 days so far. Through this, thousands, perhaps even hundreds of thousands have been praying for Pastor Saeed. We’ve seen movement in very positive ways but we’ve also seen President Obama leave Pastor Saeed out of talks with Iran. I am well aware that there may be details and motivations that we don’t know about and that being the President is not always cut and dry. However, I cannot see why the plight of Pastor Saeed has been largely ignored and why there isn’t a much larger public outcry being heard. This man’s only crime is being a Christian, yet he is being housed in a ward with some of the most violent criminals in Iran. It’s hard to know how to pray for Pastor Saeed and his family. God’s will will be done. Of that I am sure and I will continue to pray. I want to pray for freedom for him (and I do), yet I know that he is making an impact where he is. One that may shake the very core of that prison. Naghmeh (Pastor Saeed’s wife) wrote this on Facebook last month about Pastor Saeed’s time in Evin Prison. Wow, what an amazing impact he has already made for the Lord in a situation so desperate. My prayer is that the Lord will surround Pastor Saeed and his family with an abundance of peace and the sure knowledge that He is in control and loves them so much. Prayer is fantastic and so easy. The Lord loves it when we come to Him. That is, after all, why He created us. This is something so many of us can do. It’s quick and easy and could make a huge difference in the life of Pastor Saeed and those who love him. I hope that you will join me in spreading the story of Pastor Saeed all over the world. Together we can be a huge beacon of light on a huge injustice. More than that though, let us come together and pray that the Lord will continue to use Pastor Saeed’s imprisonment for His glory! That many will be brought to the only One who saves. The only One who loves completely. The One true God. Also, pray for others who are also facing persecution! I heard this song for the first time today and I can see evidence that, through all this horror, Pastor Saeed (and his family) are living this. So many ARE seeing the Lord in them. For more information on Pastor Saeed and the path the Lord has him on, click HERE. 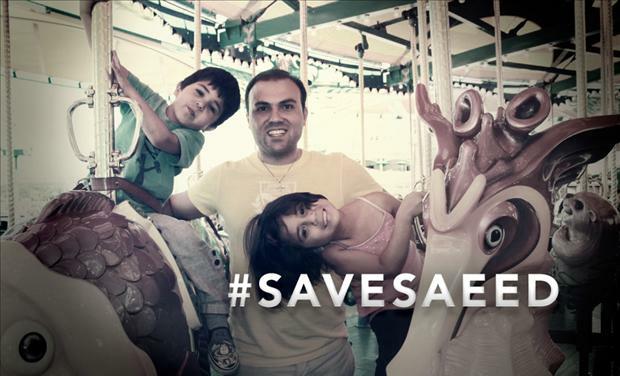 For the Facebook page ‘Pray for Pastor Saeed Abedini’ where you can see all the updates, click HERE. For more information on tomorrow’s social media outcry, please click HERE.